There are many historical instances of kidnapping victims developing sympathetic and even romantic feelings for their captors. Bank robberies don’t tend to produce the same reactions, especially because, unless they turn into a far longer and more laborious ordeal, they happen quickly and, through fear, usually lead to quick compliance. Some can turn violent and prove particularly traumatizing, while others are over almost before they start and don’t linger as an overly negative memory for those affected. In rare cases, it occurs like a simple transaction, with the person demanding money asking in a very polite and almost charming manner. Forrest Tucker (Robert Redford) walks into a bank wearing what looks like a hearing aid in the 1980s and calmly robs it with a smile on his face. This is the way he operates, smiling and utilizing pleasantries to catch the tellers and managers off guard, harming no one in the process and walking away with a load of cash each time. As dogged detective John Hunt (Casey Affleck) gets closer to tracking down Tucker and his “Over-the-Hill Gang” of senior citizen robbers, Tucker develops a relationship with Jewel (Sissy Spacek), a woman that he meets on the run from one of his jobs and who is blissfully unaware of just what it is that the man she’s falling for does for a living, even after he freely admits it on their first date. Redford, who himself is eighty-two years old, a bit more senior than the real-life person he portrays, truly makes this film what it is. 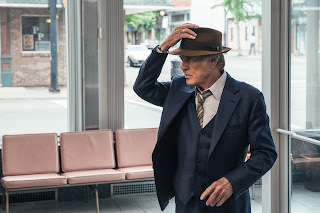 He has been working steadily for nearly half a century and, if this performance is any indication, shows no signs of letting up anytime soon, despite claims that this is his last film. Redford makes Tucker extremely endearing, most concerned with treating those he’s stealing from with dignity and kindness, almost inviting them to join in on his caper and have a blast with him. With a different actor in the lead role, this film wouldn’t work nearly as well. While Affleck appears less than enthusiastic, Spacek is a perfect foil for Tucker, just as nice but with much sincerer intentions. Tucker is a fascinating subject, particularly for the way that he enjoys the chase, famous for his numerous incredible escapes from prison, a place he didn’t mind returning to over and over since he knew he’d find a way out eventually each time. The way that Tucker’s adventures are showcased in this film works to tremendous effect, with a purposefully dated, slow feel to it, emphasizing characters and their motivations rather than being driven by the admittedly extremely interesting events being depicted. Its rather short runtime brings its story to a close somewhat swiftly, but everything up until that point is compelling in the way that it’s framed and compelling in its own right.